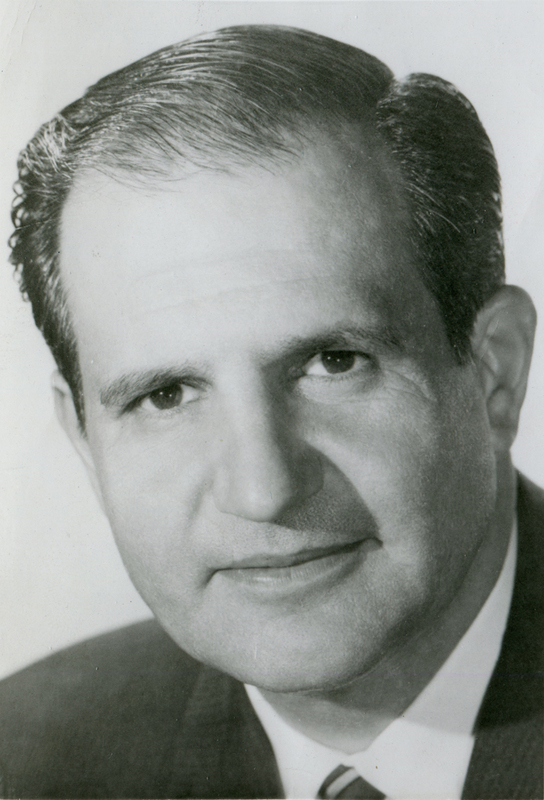 Peter J. Pitchess was Los Angeles County's 28th sheriff, serving the better part of six terms from Dec. 1, 1959, to Jan. 17, 1982, during which time he is credited with transforming the department "from a rustic cowboy agency into a modern professional law enforcement organization" (L.A. Times). Upon his retirement the Board of Supervisors dubbed him "sheriff emeritus for the rest of his life," and in 1983 the former Wayside jail facilities in Castaic were renamed the Peter J. Pitchess Honor Rancho (later Peter J. Pitchess Detention Center). Pitchess was born February 26, 1912, to Greek Orthodox parents in Salt Lake City. He earned his bachelor's degree in 1938 and his law degree in 1940 from the University of Utah. He joined the FBI and served 12 years as a special agent in offices throughout the country. He left the FBI in 1952 and spent a year as head of security for Richfield Oil Corp. before joining the LASD as undersheriff to Eugene Biscailuz. By 1958 he was seen as Biscailuz's natural successor. He won the agency's top job in his attempt, and he would repeat the feat every time he ran for reelection. Pitchess was a breed apart from Biscailuz, a self-styled cowboy who had taken office in 1932 and had lived in Newhall. Pitchess behaved more like a big-city police chief and recalled all of the honorary sheriff badges that Biscailuz had handed out like candy to celebrities and political friends. Although the county supervisors appreciated him after the fact, while Pitchess was still in office they were often at odds as the sheriff fought for more money for a bigger force, better equipment, modernized jail facilities and higher salaries for deputies. Pitchess earned honorary doctorates from L.A. Pacific College in 1963, Pepperdine University in 1976, and the L.A. Area Boy Scouts of America in 1978. Although he had supporters in L.A.'s minority communities, Pitchess' biggest public crisis involved the department's handling of an organized Chicano protest to the Vietnam War in August 1970. A peaceful protest escalated into a riot, and KMEX-TV's news director, Ruben Salazar, was killed when a deputy fired a tear-gas canister into a bar where Salazar had stopped to use the restroom. Pitchess disavowed any deputy misconduct, but the eventual wrongful-death award cost the county hundreds of thousands of dollars. Pitchess continued to win reelection; on June 10, 1981, he announced he would not seek a seventh term (Biscailuz had served 7½ terms), and he simultaneously endorsed his undersheriff, Sherman Block, to become his successor. Then he decided not to finish out his sixth term. He resigned the office January 17, 1982, and the Board of Supervisors appointed Block to the position. They knew Block to be more bureaucratic and less prone to making waves than Pitchess had been. Block was sworn in the next day, January 18, 1982, and held the office for nearly 16 years. Block died in office in 1998, narrowly predeceasing Pitchess, who died at his Newport Beach home on April 4, 1999. He was 87. LW2468: 19200 dpi jpeg from original publicity photograph.